Please list the appropriate Delta+R / Delta–R (localized reservoir correction) for the area of collection so that we can provide the most appropriate calendar calibration for the result. Note – Fees are inclusive of d13C and d18O measurements done in an isotope ratio mass spectrometer (IRMS), quality assurance reports, calendar calibration when applicable, and 24/7 web access to past results and pending analyses. Pretreatment for Corals – AMS dating requires as little as 3 milligrams of coral after the pretreatment. However, we recommend 50-100 milligrams be sent to allow for an aggressive cleaning prior to the dating (and repeat analyses if necessary for confirming results based on quality control measures, at no additional cost to the client). Most shells, corals, and other carbonate materials are cleaned by physical abrasion to remove the outer surfaces and any adhering carbonate material and are then acid etched to remove approximately 10-30% or greater of the total weight so that only the good primary carbonate is dated. Powdered Carbonates – Please take note that exposure to atmospheric carbon dioxide (CO2) may affect the radiocarbon dating results. It has been shown that powdered carbonates will absorb atmospheric CO2 due to the very large surface area. If the material is quite old (>20 ky), it is possible that long-term exposure to the atmosphere can bias the result in the more recent direction by some unknown degree. When it is necessary to extract carbonates by drilling or powdering specific areas of the material (especially those suspected to be very old – greater than 20 ky), we recommend that the drilling be done under an inert gas (like N2, Ar, etc.) and that the material be stored in very small vials and sent to us without delay. If the materials are not very old (< 20 ky), extraction under an inert gas is not necessary. However, the powdered carbonates should still be stored in small vials so as to limit exposure to the atmosphere. Powdered carbonates should not be stored for extended periods of time. Reporting – Results available as Conventional Radiocarbon Age, percent modern carbon (pMC), fraction modern (fM), Delta-14C (D14C) or Δ14C upon request. Shells are often sent to accelerator mass spectrometry (AMS) labs for radiocarbon dating. A great proportion of shell materials sent to AMS labs for carbon 14 dating are mollusk shells. Shells are not easy to radiocarbon date; there are many factors that contribute uncertainties to the results. American physical chemist Willard Libby, a pioneer of the radiocarbon dating technology, predicted shells to be the least effective materials to radiocarbon date. 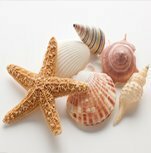 Shells can be categorized as marine, estuarine, or riverine. Analysts in AMS labs need to know the type of shell they are dealing with in order to establish the potential contaminants and determine the methods to remove them. Shellfish obtain carbon from the biosphere for shell building. According to scientific studies, shellfish obtain organic carbon from marine or terrestrial plants and inorganic carbon from ocean water bicarbonate, atmospheric carbon dioxide, or freshwater bicarbonate. Shells are formed by the deposition of calcium carbonate crystals to an organic matrix, which is a protein called conchiolin. This protein makes up only a few percent of the shell, hence the sample needed in the radiocarbon dating process is the inorganic portion. Although inorganic, the carbonate is still datable since its formation involves incorporation of carbon 14 from the biosphere. The carbonate present in shells is usually in the form of the mineral aragonite although some shells are mixtures of aragonite and calcite while others, like oyster shell, is mostly calcite. The use of the shell’s carbonate component presents problems because the substance is soluble and may isotopically or chemically exchange with its environment. When a shell exchanges carbon with soil acids around it, the shell’s carbon 14 ratio, and thus radiocarbon age, is altered. This carbon exchange usually affects the shell’s exterior. Recrystallization, on the other hand, can affect even the inner layers of a shell. This phenomenon, accompanied by the conversion of aragonite to calcite, also alters the carbon 14 ratio. Recrystallization usually occurs when the shell exchanges carbon with modern calcite. There are two source or reservoir effects relevant to the radiocarbon dating of shells—the marine effect and the hard water effect. Age offset evaluation must be done on radiocarbon dating results on shells because of these effects. The marine effect is a consequence of the slow mixing between surface waters and deep waters in the oceans. The rapid exchange of carbon between the atmosphere and the biosphere via the carbon dioxide pathway is not exactly the same between the atmosphere and the oceans. Carbon dioxide equilibrium between the atmosphere and surface waters is achieved relatively quickly. Surface waters, however, exchange carbon dioxide with deeper waters in a rate that is so slow, the carbon 14 content of the incoming carbon dioxide from the surface water and the outgoing carbon dioxide from the deep waters may already be in different stages of radiocarbon decay. Studies show that the residence time of carbon 14 in the atmosphere ranges between 6 years and 10 years while the residence time of carbon 14 in oceans could take thousands of years. Upwelling is another phenomenon that dilutes radiocarbon content of surface waters. In certain parts of the globe, the equatorial region in particular, deep waters move up. This phenomenon is latitude dependent and occurs as a consequence of trade winds. Coastline shape, local climate and wind, and ocean bottom topography also contribute to upwelling. The slow mixing and the upwelling of deep waters mean that the surface water of oceans already have apparent radiocarbon age relative to the atmosphere. Freshwater shells may not be affected by the marine reservoir effect, but they are susceptible to the hard water effect—the presence of calcium ions resulting from the dissolution of infinite-age calcium carbonate. The presence of calcium ions coincides with carbon-14 depletion although the magnitude of the hard water effect is not directly correlated with the amount of calcium ions. This effect causes the ages of samples to appear older than they actually are due to the incorporation of older CaCO3 that has been dissolved into the freshwater source from substances like limestone or marl that the lake or streams move through. This is sometimes tested by dating living shells in the same area to see if they yield modern results or older results. This bias can be on the order of a few decades to several hundred years depending on different factors. Hard water effect can also affect marine shells deposited in areas where there is an influx of carbonate-rich freshwater like in river mouths. Terrestrial shells, like snail shell, are also affected by the hard water effect in cases when the organism has been feeding on carbonate-rich areas like a chalkland. AMS lab analysts must know the reservoir effects that could affect any given shell sample so they will know the age offsets needed. AMS labs quantify the marine and hard water reservoir effects by assuming there has been no change in radiocarbon content and by dating known-age shells of the same species from the same locality that have been collected before the nuclear weapons testing of the 1950s and 1960s. The Delta±R value is only used for marine carbonates. Depending on the age of the marine carbonate, a 200- to 500-year correction (i.e. global marine reservoir correction) is applied automatically for all marine carbonates. This automatic correction means the radiocarbon date gets more recent in time due to the fact that it takes 200-500 years for present-day carbon dioxide in the atmosphere to be incorporated and distributed (equilibrated) through the ocean water column. A Delta±R correction is applied to the sample that has already been corrected with the global marine reservoir correction. The value that is provided by the client is subtracted or added to this already corrected age (depending if it is a Delta+R or Delta–R value). Note: A negative Delta-R will make the date older (typically presuming freshwater dilution from the global marine average). Sample reports showing the difference between a radiocarbon date of 1000 +/-30 BP with and without a Delta±R correction is found here. The local environment of an organism assimilating the carbon is one of the factors to be considered before subjecting the sample to accelerator mass spectrometry radiocarbon dating. AMS lab analysts must know the types of contaminants the shell samples could have been exposed to. Any carbon-containing substance that can change the carbon 14 content of a shell sample upon contact is a contaminant. This means that calcium carbonate, soil humic materials, and soil carbon dioxide are potential contaminants. The most common contaminants of shell samples for radiocarbon dating are those that are caused by isotopic exchange and recrystallization. AMS labs perform pretreatment before carbon 14 dating to remove all possible contaminants that would lead to inaccurate results. Either an acid etch, sonication in alkali or no pretreatment. Given enough material, the lab typically etches off the outer half of the shell to eliminate any potential secondary carbonate. Please consider this when selecting your samples. Generally, the more material provided the better chance of yielding good results. Physical pretreatment of shells before carbon dating involves removal of all visible contaminants from the shells without using any chemicals as well as reduction of the sample size. The outer layer of the shell is removed with a drill and carborundum paper to isolate aragonite—the analyte for AMS radiocarbon dating. Calcite that has recrystallized, and therefore a contaminant, is white and chalky and easily removed by drilling. AMS lab analysts crush the shell samples in a mortar and pestle to increase the surface area before further pretreatment is done. Chemical pretreatment employed by AMS labs involve washing the shells with dilute acid, usually hydrochloric acid (HCl), to remove a portion of the shell’s exterior and calcite components. In the case of very small or tiny samples, we may be limited to a very minor etch or no etch at all. In cases of adhering material and/or the presence of cavities, sonication may be performed.